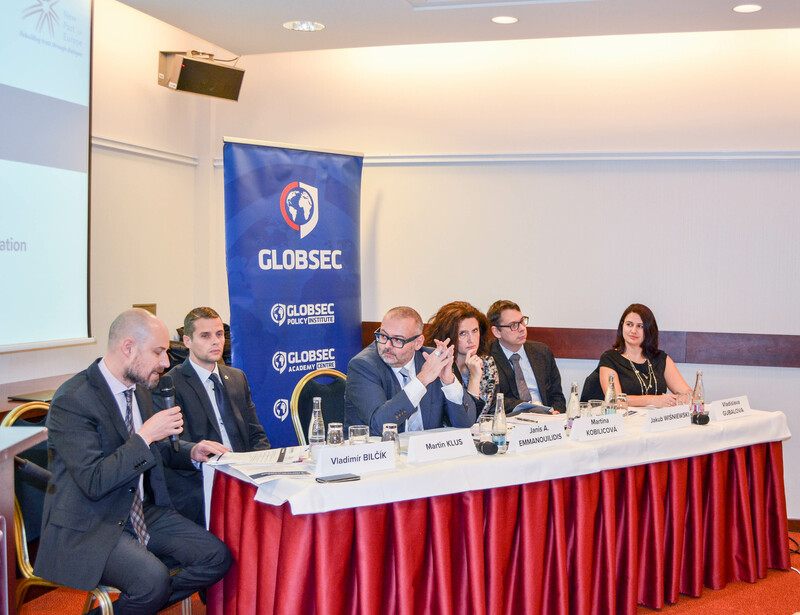 Hosted by GLOBSEC, on 6 December 2017, the third New Pact for Europe Report “Re-energising Europe: A package deal for the EU27” was launched in Bratislava, Slovakia. The report is unique as it reflects more than 120 national and transnational debates on the state and future of the European Union, which have taken place in 11 EU countries. It proposes an ambitious but realistic win-win package deal to overcome deadlocks and counter the danger of more regressive Europe. Mr. Bilčík set the stage with identifying several structural and operational changes that have been significantly influencing Europe. Some included the EU enlargement, security of Europe and the shift in economic paradigm. Topped with constant crisis management, disassociation and disappearing consensus on the meaning of the EU in the domestic political debates, it is not surprising to find ourselves at time when a new deal for Europe needs to be delivered. Ms. Emmanouilidis gave an overview of the comprehensive win-win deal proposed in the New Pact for Europe report. He stressed on the need for “political will and courage” to be used during the “window of opportunity” currently available to re-energise Europe. It is not about re-inventing the EU but ensuring that an acceptable bargain is agreed upon to achieve tangible progress in the framework of the current EU treaties. There are distinctive interests and aspirations of member states and citizens. These include economic and social dimension, defence and security and the migration dimension. In each area, the New Pact for Europe report has tried to strike a balance between, often, opposite camps. Re-energising Europe is about countering fragmentation among member states and polarisation within societies—these can be fertile grounds on which extremism, populism and authoritarianism thrive. The report drew insightful comments from the other panellists, especially in the context of Slovakia. Ms. Kobilicová referred to the necessary balance between “risk reduction” and “risk sharing.” While Slovakia is more supportive to stricter fiscal discipline and adherence to common rules, it is clear that it is not enough to secure a comprehensive economic and financial security without preparing the ground of some “risk sharing” mechanisms. Mr. Klus identified 6 critical points for Europe, its citizens and Slovakia: Brexit, migration and security, extremism and radicalism, understanding of solidarity, future reform of the EU and Europe that is closer to the citizens. He warned that unless these issues are carefully addressed red lines cannot be crossed and divisions will remain. Ms. Gubalova identified the challenges that Slovakia will have to deal with if the European structural and cohesion funds decrease while fast-track economic convergence is expected. She also addressed the importance of energy security in the context of Slovakia. Mr. Wiśniewski pointed out that there is a lot of homework to be done on national level with systemic structural reforms. But more importantly not hosting European agencies or heading European institutions should not be taken as a setback, rather as a motivator to work harder within the framework of the European project.